An enrolled member of the Monacan Indian Nation, Karenne serves on the Tribal Council. She has worked as an editorial assistant. real estate agent, a domestic violence victims' advocate, and as an activist for the rights of women and American Indians and for environmental issues. She has studied at the University of Virginia and George Mason University. Karenne's work has been published in, among others, The American Indian Culture and Research Journal , The American Indian Quarterly , Black Bear Review , Black Buzzard Review , The Chattahoochee Review , The Chiron Review , Iris: A Journal about Women , Monacan News , Orion , Phoebe , Potato Eyes , and Red Ink . Karenne lives in Arlington, Virginia with her family. Karenne received the Diane Decorah Award for Poetry in 2000 from the Native Writers' Circle of the Americas for her book of poems, Markings on Earth . She was recently named 2002 Wordcraft Circle Writer of the Year in Creative Writing: Poetry for Markings on Earth. 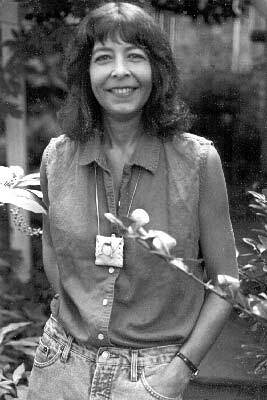 Karenne was a finalist for the Ruth Lilley Poetry Fellowship in 2000. Markings on Earth University of Arizona Press. The People Who Stayed Behind , Geary Hobson and Janet McAdams (Editors), [Forthcoming]. Marijo Moore (Ed. ), Renegade Planets Pub. Greg Young-Ing (Ed. ), Theytus Books. This is an "official" site in that this page was constructed with the assistance and active collaboration of the poet, Karenne Wood. The website "author" is Karen M. Strom. © 2001 Karenne Wood and Karen Strom.